Sparrow is the common name for various small passerine (perching) birds applied either to various members of the Old World family Passeridae ("true sparrows") or the American sparrows, or New World sparrows, within the family Emberizidae. (In some classifications, the American sparrows are placed within the finch family Fringillidae.) The American sparrows are not closely related to the true sparrows, despite some physical resemblance, such as the seed-eater's bill and frequently well-marked heads. The sparrows, with their unique forms, behaviors, and songs, add an important component to the joy that humans feel in experiencing nature. 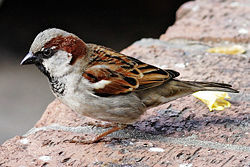 In the original sense of the term as any small bird, the sparrow also appears in the New Testament of the Bible as an apt metaphor for the importance that God places on human beings. Jesus reassures his followers that even a sparrow cannot fall without God's notice (Luke 12:6; Mathew 10:29), telling them "Do not fear therefore; you are of more value than many sparrows." Sparrows, whether the term is used for the Old World birds or the New World species, belong to the order Passeriformes, the largest order of birds, with more than half of all species. The passerines are true perching birds, being specialized for holding onto a branch, with three toes directed forward without any webbing or joining, and one toe directed backward. In other orders of birds, the toe arrangement is different. The order includes such birds as finches, warblers, and jays. The group gets its name from the Latin name for the house sparrow, Passer domesticus. Passerines are all terrestrial, found on all continents except Antarctica. Most passerines lay colored eggs, in contrast to non-passerines, where the color generally is white, with some exceptions. Sparrows belong to the passerine suborder Passeri, and thus are known as "songbirds" or "oscines." In the oscines, the vocal organ is developed in such a way as to produce various sound notes, commonly known as bird song. Oscines have the most control of their syrinx muscles among birds, producing a wide range of songs and other vocalizations (though some of them, such as the crows, do not sound like it, while others like the Lyrebird are accomplished imitators). Besides the sparrows, song birds include lyrebirds, blackbirds, jays, larks, warblers, finches, wrens, starlings, and cowbirds. Within the Passeri and superfamily Passeroidea, there are various families, two of which are Passeridae (true sparrows) and Emberizidae (buntings and American sparrows). The American sparrows, which are not closely related to the Old World sparrows, have habits similar to those of finches, which comprise the family Fringillidae within the same superfamily. Older sources may place some emberizids in the Fringillidae (traditionally grouped as the subfamily Emberizinae), and the common names of some emberizids still refer to them as finches. The Hedge Sparrow or Dunnock (Prunella modularis) is unrelated to either group, being in the passerine family Prunellidae. It is a sparrow in name only, a relic of the old practice of calling any small bird a "sparrow." The true sparrows, the Old World sparrows in the family Passeridae, are small passerine birds. Generally, sparrows tend to be small, plump brown-gray birds with short tails and stubby yet powerful beaks. The differences between sparrow species can be subtle. They are primarily seed-eaters, though they also consume small insects. A few species scavenge for food around cities and, like gulls or rock pigeons, will happily eat virtually anything in small quantities. This family ranges in size from the Chestnut Sparrow (Passer eminibey), at 11.4 cm (4.5 inches) and 13.4 g., to the Parrot-billed Sparrow (Passer gongonensis), at 18 cm (7 inches) and 42 g. (1.5 oz). The Old World true sparrows are found indigenously in Europe, Africa, and Asia. In Australia and the Americas, early settlers imported some species, which quickly naturalized, particularly in urban and degraded areas. 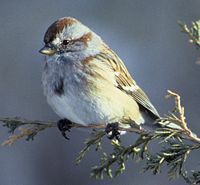 House sparrows (Passer domesticus), for example, are now found throughout North America, in every state of Australia except Western Australia, and over much of the heavily populated parts of South America. House sparrows were misnamed English sparrows, to distinguish them from native fauna, but are not particularly a native of England (Zim and Gabrielson 1956). Some authorities also classify the closely related estrildid finches of the equatorial regions and Australasia as members of the Passeridae. Like the true sparrows, the estrildid finches are small, gregarious, and often colonial seed-eaters with short, thick, but pointed bills. They are broadly similar in structure and habits, but tend to be very colorful and vary greatly in their plumage. About 140 species are native to the Old World tropics and Australasia. Most taxonomic schemes list the estrildid finches as the separate family Estrildidae, leaving just the true sparrows in Passeridae. There are 35 species of Old World sparrows. Below is the full list. American sparrows are a group of mainly New World passerine birds, forming part of the family Emberizidae. American sparrows are seed-eating birds with conical bills, brown or gray in color, and many species have distinctive head patterns. Although they share the name sparrow, American sparrows are more closely related to Old World buntings (family Emberizidae) than they are to the Old World sparrows (family Passeridae). American sparrows are also similar in both appearance and habit to finches, with which they sometimes used to be classified. Zim, H. S., and I. N. Gabrielson. 1956. Birds: A Guide to the Most Familiar American Birds. New York: Golden Press. This page was last modified on 2 April 2008, at 16:50.